Few days ago, video of a little school girl ranting after she was chased from school for not paying school fees, went viral. In the video, the girl about 7 or 8 was was stopped on the road and asked why she wasn't in school and she revealed she was chased out for not paying school fees. She then launched into a rant about how her she should have been flogged and let her stay in school, rather than chase her home. She pointed out that it's not as if she wouldn't pay the fees eventually. She also added that if they had flogged her, they would be the ones to get tired. The girl concluded her rant by saying that since the school thinks they are stubborn, she will show them she's way more stubborn. 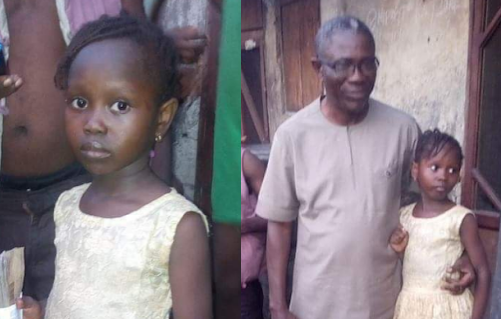 This little girl gets visit from Delta state government official who gifted some money and promised to establish her parent. Swipe to see.. The viral video led to celebrities asking to be linked with the girl so they can pay her school fees or even take her to a better. 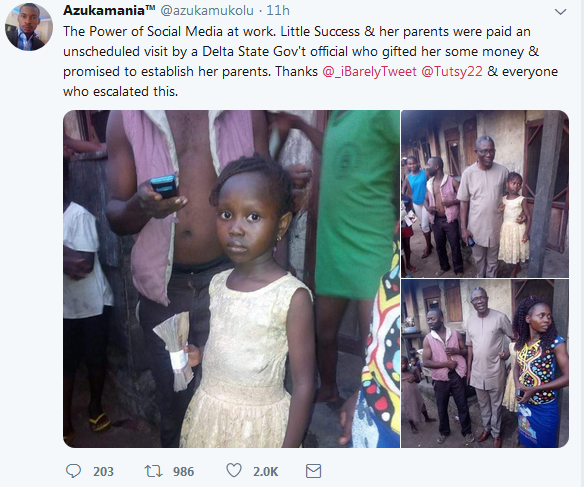 Now, according a tweet, her parents were paid an unscheduled visit by a Delta State government official who gifted her some money & promised to establish her parents.